Something I made for Sieppo, the children's magazine of Finnish Nature League. Kayentatherium was a rather large (around the size of a large beaver) tritylodont, or a non-mammalian synapsid. 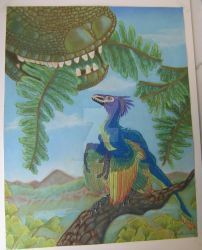 Living in Early Jurassic, it coexisted with dinosaurs such as Dilophosaurus. Last year, a report of a wonderful fossil specimen shed light to the breeding habits of this long-gone animal. A stone block, which was supposed to contain the bones of a single adult Kayentatherium, turned out to be full of tiny teeth and bones. Babies! Altogether, there were at least 38 baby Kayentatheriums, each tiny compared to the adult, but already well-formed and seemingly ready to face the world. They did not have the underdeveloped, baby-like features of most modern baby mammals, but were almost like miniature copies of their parents. Researchers suggested they died just after hatching from eggs, or just before they would have hatched. So, I depicted the moment of hatching within a stylized nest burrow lined with twigs and leaves. This find shows that at least this particular species of tritylodont still retained a rather reptile-like reproductive habit, laying lots of eggs with small but precocious young. Still, as in many reptiles and amphibians, a parent guarded the egg until hatching. It's unknown whether the adult was a mother or a father, or if it would have still cared for the young for some time after hatching, hadn't they all died. More ancient horses! Will it ever end? I tried painting over a few pencil sketches and sort of liked the result. What do you guys think about this technique? These are Miocene and Pliocene horses: three-toed, browsing species, hiding in forests instead of galloping through the plains. Cormohipparion (upper left) lived in North America from Miocene to Pliocene, coexisting with the 'dachshund rhinoceros' Teleoceras. Proboscidipparion (upper right) was a rather unusual horse from Pliocene of Eurasia, with retracted nasal bones similar to a tapir or a moose. Anchitherium (bottom) was a highly successful Miocene equine that spread from North America through Eurasia. Despite its generally horse-like looks, it was tiny: only about 60 cm tall, or the same size as a largish dog. So, I painted a horse. This one was just a night practise that accidentally turned into a painting. It's not based on any paleontological find in particular, but it is supposed to be Late Pleistocene Equus ferus ferus, the Eurasian wild horse. Coloration is inspired by the 13,000-year-old paintings in Ekain Cave, Spain, which show a rather dark reddish dun horse and others that have multiple striped on their necks. The strong pangaré pattern (fur being lighter on the underside) and dark head and neck are also often shown in cave art. I rarely do paintings - as you can see, most of my work consists of colorised line drawings. This was nice for a change, but it really takes forever to do compared to drawings. A speculative reconstruction of a small basal ornithomimosaur gliding over water, made as a commission. Ornithomimosaurs - the ostrich-mimic dinosaurs - are best known as animals such as Gallimimus, that looked much like giant ostriches with a tail. Though often illustrated as scaly in the past, they were fairly closely related to birds and are now known to have had feathers. A study back in 2012 reported something that looked suspiciously much like vaned wing feathers! At the time, a post in the Theropod Database Blog (theropoddatabase.blogspot.com/…) suggested that perhaps the small ancestors of ornithomimosaurs were more "flight-y". A similar idea was earlier suggested by Gregory S. Paul. Being descendants of gliding or flying animals might explain the presence of wing feathers in animals that are rather obviously too big to fly - much like it does in today's ostriches. So here's a very speculative idea of what the smallish, more-or-less-volant ancestors of ornithomimosaurs could have looked like. The animal is based on two basal ornithomimosaurs, Nqwebasaurs and Shenzhousaurus, and the aquatic environment is after the interpretation of Pelecanimimus as a fish-eater. On the background, there are aquatic ferns similar to today's Salvinia and Marsilea, and a small dragonfly. I finished the third part of my Zoology for Paleoartists blog posts. While the last two were concerned on which colours are possible in non-avian dinosaurs, this one discusses what kind of colours are ecologically plausible - that is, how evolution shapes animal colour. The needs to camouflage, impress mates or warn off predators are different for each species, producing the incredible diversity of colours and patterns in the animal kingdom. A biology jack of all trades. I illustrate, blog, write and teach. Belated Happy Birthday, hope it was a good one! I would like to wish you a Happy Birthday and to tell you how much I admire your art. Please allow me to wish you Many Happy Returns on the morrow! Cool gallery, I'll be watching you! Do you have time to answer a few speculative questions?